I was quite disappointed with the lack of resources on the web when I was researching my recent cycle tour in British Columbia. It was only a short trip in summer so the risks of getting anything significantly wrong were quite low but it was quite a frustrating process. 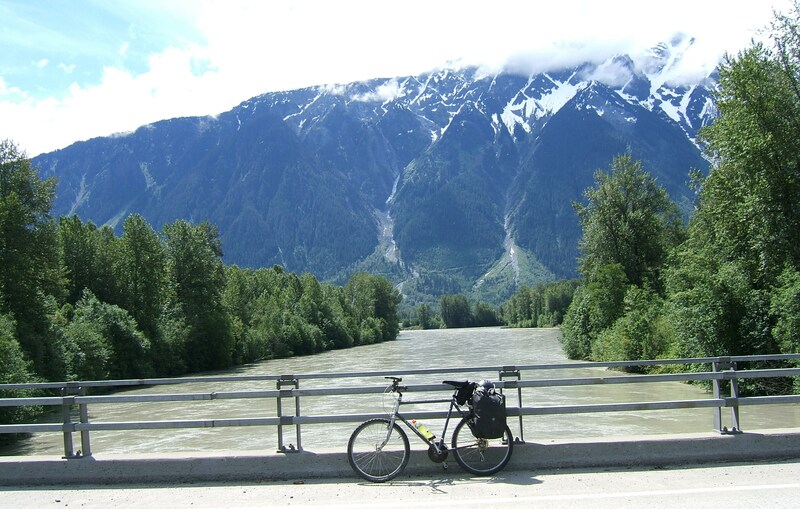 Putting “cycle touring” or “bicycle touring” British Columbia into search engines most of what I found was commercial tour operators or tourism sites that then provided no content or links to mountain biking centres. This may be linked to how few cyclists I actually saw. It was the height of summer and I only saw three tourists despite the amazing routes I was riding. Half a dozen useful comments might have alleviated some angst, so for what it is worth here are the things I wish I had known before I set out, written down to help any future travellers, in particular those more used to touring in Europe. It is not at all a definitive guide, it would be great if someone in BC gave some thought to this, it would really help. My biggest fear was the fact that the bulk of the route seemed to offer nothing but main roads including Highway 1 which in any country probably indicates a very major route. I spend time online and looking at maps to see if there were alternatives because I was quite concerned and I really couldn’t find any advice. Certainly most of the bike routes online seemed to use main roads so I guessed I would be OK. In reality I didn’t have much to worry about for three main reasons. Firstly the traffic volumes were really pretty low by European standards except for a couple of sections. Without the RVs (recreational vehicles or campervans) some sections would have been almost deserted. Secondly the wide shoulders on most routes were an excellent cycling route. Thirdly the behaviour of Canadian drivers. I have never cycled anywhere where the drivers gave a lone cyclist such a wide margin when passing – remarkable. In particular truck and commercial vehicle drivers in the similarly deserted South Island of New Zealand could take a big lesson from the Canadians. However I will give this a health warning. There were some busy sections I cycled near Kamloops and Kelowna, but in both cases there were alternatives near these larger towns. My section of Highway 1 was bypassed by an alternative new route and when the two sections recombined it was much busier. The short section of a major truck route on Highway 97 North/South just north of Cache Creek indicated that this might not have been so much fun had I chosen to follow it for a long distance. And some colleagues reported that they felt that the provision of a cycle route alongside the 4 lane highway from Vancouver to Whistler just did not look safe because of vehicle speeds, but the person who rode it didn’t complain and I felt it didn’t look too bad from the bus. However in general I would strongly say that even these specific examples were manageable and the rest were amazingly quiet and I really don’t know why I worried. Second health warning – I wonder what this is like nearer to winter, because I guess snow could fill the shoulders even if the road is ploughed for vehicles. I would also flag that there were really no alternatives except dirt roads in many cases. For example I spent a lot of time looking at alternatives from Cache Creek to Kamloops to avoid Highway 1. I thought it might be possible to go to Ashcroft and follow dirt roads to Savona. But I looked at several sources on paper and on line but I never really did work out whether the road went through, and one mystery line turned out to be a railway, not a road! From the plane on my way back to Vancouver I got a much better understanding of the wide network of dirt roads in the back country because the dry weather had dried them to a yellow sand or clay colour which contrasted to the forest well. However I would not have wanted to risk them without very good mapping and a satnav or compass, and a full mountain bike because there was not a flat section in sight. So in Vancouver I looked for some alternatives. It was a complete disaster. The one and only map shop in Downtown Vancouver had closed and the alternative shops had a rubbish selection of town maps or maps on a huge scale that did not give enough detail for cycling. I thought I might do better in Whistler, but for an outdoor town the selection was to my eyes still really poor. The only maps that appeared anything like the detail I would expect were a couple of atlases calling themselves “Backroads” atlases aimed at 4 Wheel Drive vehicles or Trail motorbikes. However the atlases did not cover all of my routes and would have cost me over $50 for limited benefit. In the end I navigated using Google Maps, Bikely and pages torn from tourist guides for each region. This was of course possible because of my first point above – I was sticking to the main roads and so very large scale maps were all I needed. And in reality the maps on sale tended to meet that need – a country where the long distances mean people need big maps just to travel between population centres, or detailed local maps for the back country trails used to get into the woods or hills. Neither of these really work for the cycle tourist, but in hindsight I was not significantly disadvantaged by a lack of maps. Real credit must go to online bike route website Bikely. Almost every road I wanted to ride had been covered by someone who had done it before so maps and profiles were available. It occasionally took some detective work to isolate just the section of road I needed and combine it with others to get an overall profile. But other sections were a perfect match, another rider doing just the same section. The key elements I needed were the confidence that the main roads were rideable and the route elevation profiles which told me the climbing. I also found mapping site geokov map maker which was great for topography. The other thing I didn’t really find online but I now know exist are some interesting long distance cycle routes which might well have been good to try and incorporate had I known. Simple but bonkers fact is that the Trans-Canada Trail web site does not contain the word “touring” anywhere so will never be found in a search engine looking for cycle touring routes. 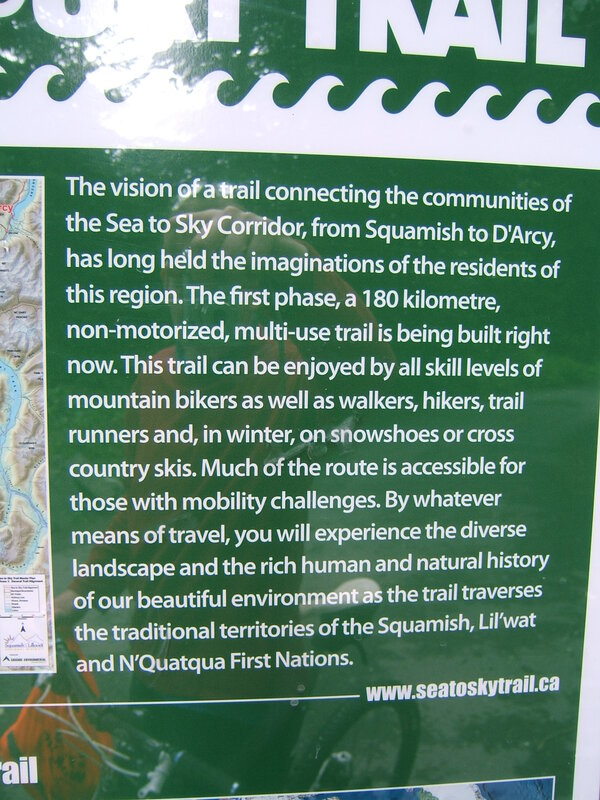 In Whistler I discovered that the Sea to Sky route which comes from Vancouver is being extended beyond Whistler and is intended to go on and link up with other Trans-Canada routes which form a greenway network across Canada. The section to the East of Whistler is going to be an offroad trail running away from the main highway. However it will be much slower than the road route because it climbs more and the surface is rougher but it will be great for those looking for leisurely and scenic riding. I also found that I was riding close to an amazing cycle route called the Kettle Valley Trail which is part of a whole network of former railway lines. The “trestles” or wooden railway bridges and tunnels have in many cases been restored and apparently provide some great cycle routes. There are published guides and histories which would have made a good pre-read and I could have aimed to include some of them in my route had I found them beforehand. Doh! 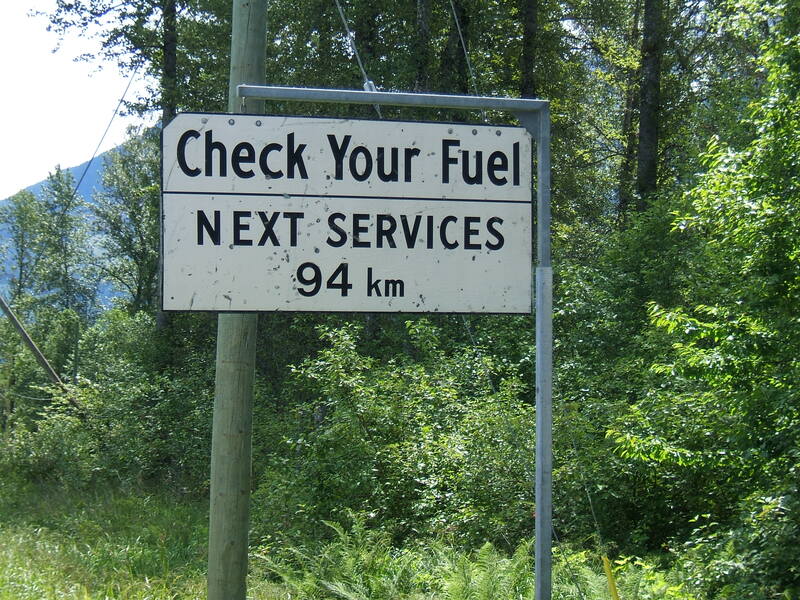 This route was in Southern British Columbia which is the relatively densely populated part of the province. Despite that there were long sections that had absolutely no services. I could easily have made some big mistakes and left myself without food and drink because these sections did include access to camp grounds and provincial park centres but unlike similar venues in other countries most of these had no public services such as shops or cafes. The ubiquitous RVs may partly be to blame, even campers travel with a week’s supplies on board. However I am told the real reason even quite big and popular camping grounds have no services is because the season is so short and it isn’t commercially viable to open a business based on just a few weeks’ sales. Therefore I carried extra food and even put a filled a Camelback bladder with extra water in my panniers for a couple of legs. The best guide I found was the web site Mile by Mile which actually specified what was available along a number of the roads I used but I would suggest caution because opening times can be a bit hit and miss too. The roads I used were in excellent condition and could be tackled on almost any road bike. I only experienced a couple of dirt roads and generally they were good too, but steep, up to 13% gradients. However I would strongly recommend consideration of a 26 inch wheeled mountain bike set up as a road tourer. The roads are steeper than continental Europe with 10-13% encountered on several occasions so the lower gears of the MTB would be useful. I was over-geared on the bike I bought, I should have got the freewheel changed as it was probably only about a 25 tooth on a road triple which wasn’t enough. But perhaps more importantly the BC mountain bike scene is vibrant and you will find spares and repairs much easier to find, even in small towns. If you are going to buy a second hand bike as I did the range of MTBs on offer is much wider too. That doesn’t mean foregoing dropped handlebars, I have regularly adapted them on to MTBs but I used some bar ends to get a different handlebar position. I stayed in motels booked through web sites apart from the Alta Vista chalet run by Bear Back in Whistler. No real plans to carry camping gear around or buy it in Vancouver. That the rooms are large and mostly ground floor and I could take my bike inside all of them. Clothes washed either in the shower or in washing machines daily and dry overnight by using the preferred wringing them out in a towel technique – always works with a plentiful supply of towels. Microwave, tea/coffee, fridge in every room so I could buy and store food, saving money on meals all the way unless I fancied buying out. Although really stupidly the rooms don’t provide plates, knives and forks so I had to buy a plastic set. The probable reason (and downside) is that the selection of foods in the average small supermarket or convenience store was generally really unhealthy and the type of stuff microwaved in a burger bun. I relied on granola and milk in a cup (or several cups) as the most reliable breakfast, topped up en route. Alta Vista Chalet would be worth using as a base (if not booked out) even if you are passing through Whistler on tour. It is a little cycling mecca – everyone on the staff and visitors is a cyclist, there is a really good workshop in the basement and the food is of the type and quantity that we love! 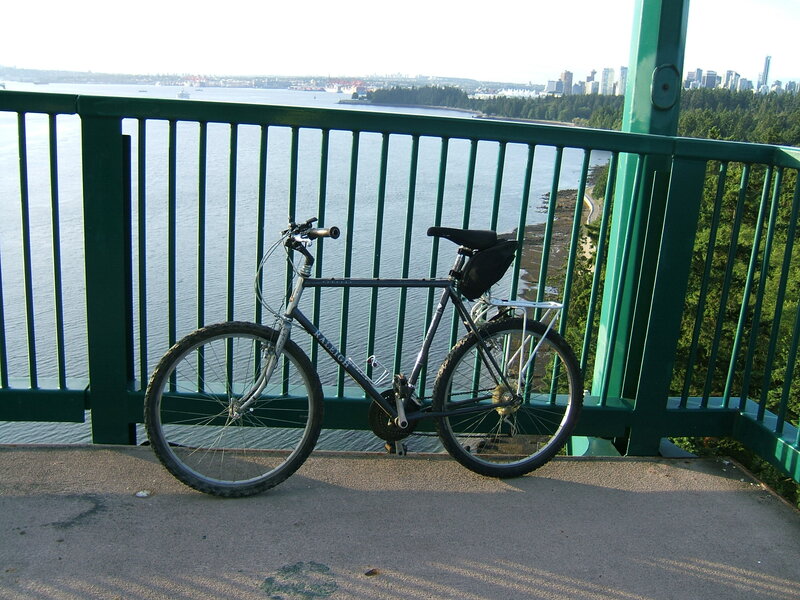 This entry was posted in Bikes, Countries, MTB, Musings, Travel and tagged bikes, British Columbia, canada, cycling, Touring, Visits, Whistler by kevinmayne. Bookmark the permalink. It’s too bad you didn’t seek out help before your trip from local cycling organization in Vancouver and British Columbia. The provincial based organization, B.C. Cycling Coalition is suggesting ways to various bodies what can be done to promote cycling in British Columbia. My partner belongs to the organization and is involved in the effort. As someone who works in the advocacy and cycle touring sector I really did expect to find someone on line. I knew about many of the advocacy groups in BC but there must be a niche for someone who does more touring advice work like CTC in the UK, FFCT in France or ADFC in Germany.